I've been doing frankens and recolors for years and have been pretty good with it but this past month, I decided it was time to step out of my comfort zone and start spriting from scratch. I've gotten some feedback and suggestions already and a heck of a lot of praise... but, seeing as all those people know and love me, I have to take their praise at half value. So I've decided to come here--to a board that I've been told gives some amazing critiques--because I want my skills to grow and my project to excel. I am using the Half-Kaizer base for my sprites. http://www.hbgames.org/forums/viewtopic.php?f=159&t=39088&start=0 I have edited the woman sprite considerably in the waist and hips areas for Iana. For the most part, I have used as starting references. I use GIMP and many layers for my spriting. The first sprite I started is for a character called Iana. I've been having trouble completing her and would love some suggestions as to how I should tackle the last few frames... as well as any tips on how to improve what I've already "completed". I had no reference--other than my imagination--for her shirt, arm wraps, and quiver. Her hair was a combination of these two hairs which were found in the compilation photo of showkaizer sprites found above. I'm not entirely sure which of those pants I used as reference for hers. A lot of edits have been made since I began. 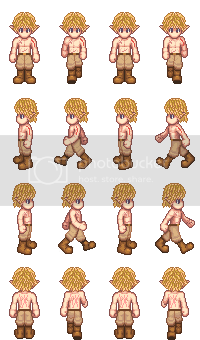 The second sprite I started is for a character called Garin. Unless anyone on this site gives me things to correct--which I'm sure they will--his sprite is finished. His hair was based off of and had no pixelated references. I think I worked on just this hair for a week because I could find no pixelated references... and I'm still happier with the fronts and backs of his hair than I am with the sides. His pants were based off of a few of the pants in the compilation above. There are quite a few that are similar. I mostly just softened the bulge at the top and darkened it more at the bottom so it looked more like baggy pants being tucked into boots than a really round cuff. The boots were freehanded over the base feet. No reference to be linked. His scars were just pulled from my imagination. The third sprite is an add-on to the shirtless Garin. The characters age and change clothes in my game--some of them having over 9 different outfits/age changes. This is Garin's first change. His jacket and shirt pieces were based off of . I'm having difficulty figuring out how to tackle the side views so any suggestions/reference pics would be greatly appreciated. it was time to step out of my comfort zone and start spriting from scratch. I don't think you are stepping out of your comfort zone, nor are you starting from scratch. The only way to really improve your spriting is to get down an dirty and create something from the ground up. 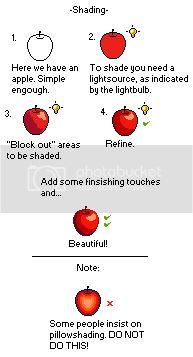 Your first sprites probably won't look as good as some of your edits, but after some practice and critique, your skills will definitely improve. For the two sprites you posted, they lack in contrast and are pillowshaded which make them look extremely flat. Well, I guess I mean spriting clothes and hair from scratch and just this much of branching off on my own makes me nervous and a bit sweaty so it's certainly not comfort zone... but I would have to agree that it's still a safety zone. I like this style for my game so I'm gonna continue with these so far as to get each principal character's sprites and a collection of NPC outfits completed. Do you think it would be beneficial for me to put production of these on hold until I've done some truly ground up work? Or should I finish this and then refine my skills while the other work on the project is being done so that I can then make edits with my improved ability? These are the first sprites I've done other than frankens and recolors. Are you referring to when I start with ground up? Did you miss the last sprite? Mkay. More contrast between shades. Could you link me to something that will help me figure out what kind of shading I need to do? I've been sent in a lot of different directions with the shading for Iana's shirt. I started off with a lot more dithering and a lot less oval. Is everything pillow shaded? Is there anything good that I should definitely keep? Continuing on with this project can still be beneficial to you, but you should also do other things on the side. Try starting out with simple things like fruit or shoes, anything that can easily be broken down into simple 3d shapes. Generally you should avoid dithering unless you want a rough texture or are working under extreme color restrictions. Not everything, but the low contrast makes it hard to tell where the shadows and highlights are. It's alright. I'm sometimes not entirely clear. Try starting out with simple things like fruit or shoes, anything that can easily be broken down into simple 3d shapes. Alright. Is there a size that would be good for me to start with? Okay. So my problem is that I've chosen a light source directly above instead of slightly to the side and above. Or am I using a light source that's directly above? Also, one reason I chose the lesser contrast is that I'm trying to go for an artsy feel with everything in this world to distinguish it from the real world. I realize this is probably not the best way to do it but it's the best one I could come up with. Do you have any suggestions? Once I looked at them a bit closer, I saw that you did shade with an overhead lightsource. -Added cloth folds for interest. I didn't touch the hair so that you could apply what you learn. Think of the head as a sphere: the bottom of the sphere will not receive as much light as the top. Also, try to suggest each strand of hair rather than outline them. And I'm not being able to get the strands to actually look like curly strands with the smaller color pallet. I just kinda looks like thick, bushy hair. 200 x 340 for the full sheet. The square boyish figure is mostly intentional right now. If I gave her any more hip, it would just be one pixel to either side. Well, Garin's *has* to be defined by strands. When you see hair like his in real life, you see it *as* strands... especially considering how oily his hair is. Bathing only in fish toilet with no soap can do that to your hair. As for Iana... I don't really know how to do it other than by strand. Could you give me an example and I'll try it out? I know for sure that I'll use shadow in the real world--but I'm not sure if I'll use it in Magin.